ISLAMABAD - In his old job as Pakistan’s spy supremo he lived in the shadows, but on Wednesday General Ashfaq Kiyani took over as army chief in bright sunshine and with the world’s eyes watching his every move. 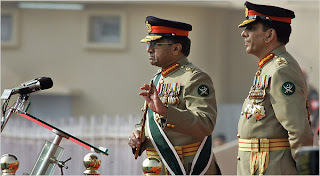 President Pervez Musharraf handed the baton of command of the nuclear-armed military to Kiyani, his 55-year-old deputy, in a colourful ceremony on a parade ground at military headquarters in Rawalpindi. But in an indication perhaps of the uncertainty of the army’s loyalties as Musharraf prepares to become a civilian president, he said he was “confident that the army will remain loyal to him (Kiyani) as it has been with me”. Musharraf handpicked the chain-smoking, golf-mad Kiyani for his loyalty and laughed off rumours spread earlier this month that Kiyani had placed him under house arrest amid anger at the emergency decree. With Musharraf facing a mounting political crisis over his three-week-old state of emergency, Kiyani’s role will be crucial in a country where the army holds most of the cards. His leadership is also of significance to the rest of the world, as the army is the frontline force against Al Qaeda and Taleban militants holed up in Pakistan’s tribal areas bordering Afghanistan. The affable yet reserved Kiyani could also play a key part behind the scenes in helping resolve Musharraf’s own fate. A former aide to opposition leader Benazir Bhutto, he led negotiations on power-sharing between the former premier and Musharraf — talks which she has now called off. Kiyani also has good ties with Pakistan’s increasingly impatient backers in Washington, and his name emerged amid reports that the United States is making contingency plans for a post-Musharraf era. “All eyes are on Kiyani,” said Hassan Abbas, an analyst with the John F. Kennedy School of Government at Harvard University. Abbas suggested that under Kiyani, the Pakistani army would remain influential but retreat from the political scene, end the emergency and allow elections, which could install Bhutto or another politician as premier. Former general turned political analyst Talat Masood told AFP that Kiyani was a “professional soldier and highly regarded,” and that leadership of the country’s military “is passing into the right hands”. Security officials and analysts described Kiyani as quiet and easy to get along with. “He is a very good listener — speaks less, thinks more,” one official said. He is also a rarity in Pakistan’s often privilege-dominated society as the son of a junior officer from Jhelum, a city in Punjab province from which the army draws much of its manpower. Kiyani is a former head of the Rawalpindi Corps, whose 111 Brigade led most of the coups in Pakistan’s military-dominated history. In 2004, Musharraf appointed him to lead the Inter-Services Intelligence agency, which hunts Al Qaeda militants and provides internal security. Army biographies say Kiyani is a keen sportsman as well as president of the Pakistan Golf Association. He is married and has a son and daughter. He joined the army in 1971 and commanded several infantry units, according to a military statement. He is a graduate of Fort Leavenworth military college in the United States. In my opinion President P. Musharaf was doing well. But I don't know why he listen USA and bring the worst person back to Pakistan (Nawaz sharif). Who says he believe on democracy? As well the Beinazir Bhotu, I think every one have seen her on the television program, when she were asked question about her brother assignation, while she was prime minister of Pakistan. And she shows anger and left the program. These both are the agent of USA to destroy our Atomic power in the interest of Israel, because USA wants to take hold on Arab World by Israel that’s it. As we have the atomic power they are not able to do any thing against Arab countries. And I am so sad in this situation that our corrupt politicians are their hand tools. Allah may save our Muslim world from these wicked personalities. As well the Beinazir Bhotu, I think every one have seen her on the television program, when she were asked question about her brother assassination, while she was prime minister of Pakistan. And she shows anger and left the program.